WBCS Admit Card 2019 – West Bengal Public Service Commission (WBPSC) has released the WBCS Admit Card 2019 for the Preliminary Examination on January 22, 2019. The WBCS Admit card has been made available at the official website i.e. pscwbonline.gov.in. For fetching the WBCS admit card candidates will need to mention the Enrollment No. or First Name and Date of Birth. The preliminary examination was previously supposed to be conducted on January 20, 2019, but now the exam is scheduled to be conducted on February 09, 2019. The candidates who have filled the application form on time for those candidates WBCS Admit card has been issued. From this page, candidates will be full information regarding WBCS Admit Card 2019. Latest: The WBCS Admit Card has been released, Check the same from below. The admit card is the key to enter in the examination hall. For all the candidates it is mandatory to carry their admit card on the day of the examination. The candidates who will not carry their admit card those will be not allowed to appear for the WBCS Examination 2019. Admit Card will be not sent by post or e-mail. For more details regarding WBCS Admit Card check the schedule given below. Admit Card: Click Here to download the WBCS Admit card for the Preliminary Exam. The candidates who have submitted their application form before or till the last date for those candidates WBCS Admit Card has been issued. Candidates can follow the steps given below for downloading the admit card. At first, admit card for preliminary examination has been issued as the prelims will be conducted first. 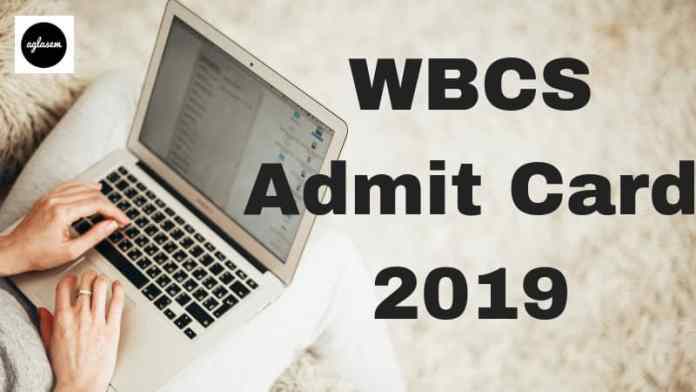 How To Download The WBCS Admit Card 2019? For downloading the WBCS Admit Card candidates can follow the steps given below. After downloading the admit card candidates should take the print out it for future reference. The link will direct to the login window, as shown below. Next, the candidates will have to enter the Enrollment No. or First Name and Date of Birth. Lastly, to conclude the admit card download process the candidates have to click on the ‘Submit’ button. Click at the download option for downloading the WBCS Admit Card 2019. Note: The candidates should note that they are required to enter their Name exactly same as submitted during the One Time Registration and same goes for the Date of Birth. It is very important for all the candidates to go through the exam pattern. Exam Pattern helps the candidates to know about the examination timing, subject details, marks, questions types etc. From below candidates can check the exam pattern of WBCS 2019. The West Bengal Civil Services examination will be conducted in Kolkata and a few other districts in West Bengal. The ST candidates of Darjeeling, Darjeeling Sadar, Mirik, and Kurseong will be allowed to appear for the exam at Darjeeling exam center. Candidates should note that Commission has the authority to change or add the exam center. From below candidates can check the examination center list. From below candidates can check the details mentioned on the WBCS Admit Card. After downloading the admit card candidates should read all the below-mentioned details present in the candidates admit card properly. How To Resolve Discrepancy In Admit Card? What To Carry On The Day Of The WBCS Examination 2019? On the day of the examination, candidates need to carry the below-mentioned documents. If the candidates fail to show up the below-mentioned documents those will be not allowed to appear for the examination. The candidates who will qualify the preliminary examination for those mains examination admit card will be issued. The Main exam will be conducted in Kolkata and the candidates need to appear at the allocated center only. Follow the steps given above for downloading the WBCS Admit Card. From below candidates can check the details of WBCS 2019 Mains Examination Pattern. Paper II: English – Letter writing (within 150 words) / Drafting of Report (within 200 words), Précis Writing, Composition and Translation from Bengali/Hindi/Urdu/Nepali/Santali to English. Important Note – For Group ‘A’ & ‘B’ Services & Posts all 6 compulsory papers and one optional subject consisting of two papers and for Group ‘C’ & ‘D’ Services & Posts All 6 compulsory papers. The candidates who will be shortlisted for the final round that is Personality Test for those candidates only WBCS Admit Card will be released at the official website. Along with the WB Civil Serviced Admit Card, the candidates will also get the Choice Sheet. In the choice sheet, candidates will need to mention the preferred Group and Post. The center for the Personality Test will be in the Office of WB PSC, Kolkata. In the PT alertness of mind, power of clear and logical exposition, intellectual and moral integrity, leadership and also the candidate’s range of interests will be checked by asking the questions. Candidates applied for Group ‘B’ Service (West Bengal Police Service) will be specially tested at the interviews with regard to their suitability for the service.